DECEMBER 21, 2015: At the close of the state Group Insurance Commission’s December meeting, Executive Director Dolores Mitchell stunned the crowded meeting by announcing her retirement. After leading the GIC for nearly 29 years, Mitchell will retire in 2016. The fifteen-member Commission that governs the GIC will now begin the process of hiring a new executive director. At Friday’s meeting, the consensus of the Commission was to form a subcommittee that will meet in January to develop the hiring process. Due to the fact that the GIC now insures over 430,000 lives and has an annual budget exceeding $2 billion, several Commissioners have openly called for a formal open and transparent search process. This runs contrary to the initial suggestion by Chairwoman Katherine Baicker, who suggested that the GIC could begin interviews as early as January. Baicker, a nationally known healthcare economist based at Harvard University, explained her concern over the important position remaining unfilled for an extended period. Former Association President Ralph White was among the first to meet with Mitchell back in 1987 when she was appointed to the job. He worked closely with her for nearly 27 years, before retiring himself in 2013. “We got tipped off by the Duke that he was bringing Dolores Mitchell on to run the GIC, so I headed over to her office at Katherine Gibbs to congratulate her and offer our Association’s cooperation. I think she was a little taken back that we got the news before she even had time to tell people, but from that meeting forward Dolores maintained an open door policy with us. 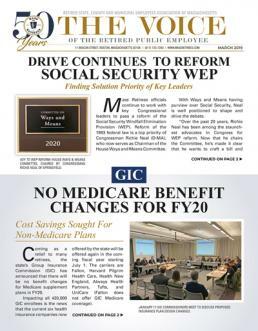 Editors Note: Please look to the March 2016 edition of the Voice for an in-depth report on the director’s search, as well as the legacy left at the GIC by Dolores Mitchell.